Of course, cannabis consumers haven’t been waiting around since voters legalized the drug here in 2016. They’ve been buying from their “guy,” growing their own, or getting certified as medical patients in order to shop at dispensaries. But both veteran stoners and curious newcomers may soon find themselves wandering into a regulated pot shop for the first time. For them, and with the help of budtender Jake Moriarty, we present the following guide, designed to alleviate ignorance, spare embarrassment, and ensure their first government-approved smoke sesh goes smoothly. Where will I be able to buy marijuana? The first marijuana stores will almost certainly be two existing medical dispensaries that have won state licenses to offer recreational (or “adult-use”) pot, too: Cultivate, in Leicester, and New England Treatment Access, known as NETA, in Northampton, where Moriarty works. Other shops will follow in the coming months. What do I need to bring with me to purchase pot? Money. They didn’t legalize this stuff so they could give it away. Most shops will accept cash and debit cards. It’s sometimes possible to use a credit card that has a PIN number, but since few consumers know their credit card PINs, we don’t recommend it. For $50, you’ll get an eighth of an ounce of marijuana flower, commonly called “an eighth.” That’s enough for about 3½ large joints, or perhaps three to four weeks of light, solo consumption (a couple hits most evenings), depending on your method of consumption. State and local taxes add 20 percent, or $10 in the case of an eighth. You’ll also need to bring a government-issued ID to prove you’re 21 or older. Passports and licenses from other states are generally acceptable as long as the shop’s ID-scanning machine recognizes it. Reminder: Minors who aren’t registered medical patients cannot go inside, even with their parents. 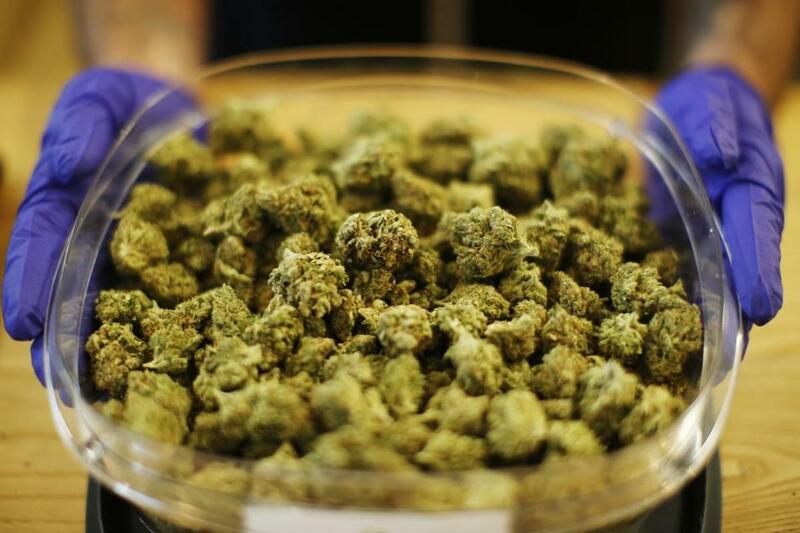 Legally, you can buy up to 1 ounce of flower (or “bud”) or 5 grams of marijuana concentrate in a single transaction. However, NETA has set an initial purchase limit of just an eighth of flower per customer per visit, fearful that the shop will quickly sell out of product too quickly if consumers buy more. Jake Moriarty displayed a strain of marijuana called “Arcata Trainwreck” in Northampton. NETA has also set up a points system that assigns equivalent values to both flower and concentrates, allowing consumers to tell if a purchase that includes both types of products exceeds the overall legal quantity limit. After you make it through the long lines expected on opening day, a worker in a vestibule will check your ID before admitting you into the main area of the shop. At some stores, including NETA, a second worker behind the counter (sometimes dubbed a “budtender”) will check your ID again, and then start helping you select products. Jake Moriarty, a Patient Service Associate a.k.a. “Budtender” at NETA in Northampton, Mass. Rather than perusing aisles of different varieties of weed and weed-infused products, you’ll be standing at a counter in which the products are displayed. Generally, an employee will chaperone your shopping experience. Feel free to ask for a sniff of a strain you’re interested in. Pick out what you want and pay at the same counter. It’s a good question — the selection can be overwhelming — but there’s no right answer. For rookie consumers, many experts recommend vaporizing a small quantity of flower (you’ll have to buy a flower vaporizer), as vapor is less potent and harsh than the smoke from combusting weed in a pipe or a prerolled joint. If you do go with a joint, don’t smoke the whole thing by yourself unless you want to end up in low-Earth orbit. 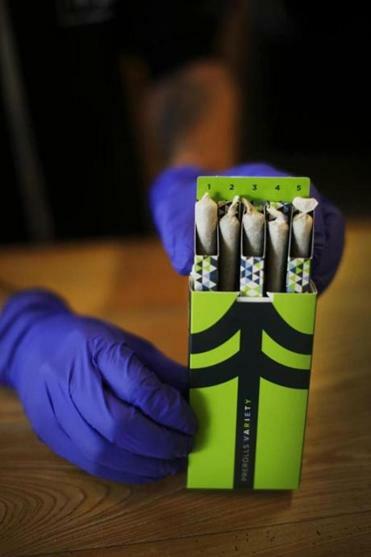 A pack of five pre-rolled joints at NETA. Vaporizer pens that heat up concentrated marijuana oil aren’t a bad option, either, though some are quite potent — start with just a sip or two. Also, some concentrates contain only THC and not the other cannabanoids and terpenes present in marijuana flower; many veteran consumers say they prefer the fuller range of effects produced by so-called whole-plant products that include those other compounds. Rookies should beware of edibles, which can take an hour or more to kick in and often produce a heavier-feeling “body high.” It’s easy to get impatient and keep nibbling more and more, only to get sucked out to sea by a gnarly riptide of a high. If you must buy those chocolate-covered marijuana-infused blueberries, begin with a small 5 milligram dose (the maximum individual serving size under state law) and promise us you won’t eat more until the next day. 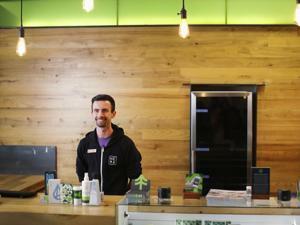 Bottom line: Tell your budtender you’re a newbie and listen to his or her suggestions. Experts also suggest first-timers try pot with a more experienced marijuana consumer, or at least a sober friend, until they become more familiar with the effects of the drug. What do I do if I get too high? Breathe, relax, and try not to make any life-altering decisions. Don’t bother to call 911 unless you’re sure you’re having a real, non-weed-related emergency. There’s little doctors can do to reverse the effects of cannabis, and hospitals are bright, noisy, and overwhelming. We suggest turning off the lights, getting in bed, and having a friend reassure you. Take comfort in the fact that while it’s possible to be uncomfortably high (and therefore extremely anxious), one cannot physically “overdose” on cannabis — the drug isn’t acutely toxic. In summary: It’ll be over soon. How should I store my stash? For transport, keep your weed in a secured area of the car out of reach of the driver (think, glovebox or trunk) to avoid violating open-container laws. At home, you can keep your flower in the plastic container it came in, away from heat and light — or, even better, transfer it to a glass jar with an airtight lid. Don’t put flower in the fridge; when you take it out, humidity will condense on the buds and could make them moldy. Some edibles may need to be refrigerated, but most will do fine in a pantry or cabinet. Finally, make sure your marijuana can’t be accessed by minors or pets. Where can I consume my marijuana? Inside a home or outside on private property where you have permission to do so. Smoking marijuana outdoors in public is illegal and can earn you a $100 fine. Oh, and this should be obvious, but don’t get high in your car. Driving under the influence of marijuana is dangerous, illegal, and could land you in serious trouble. I’m new to this and afraid I’ll look like an idiot. Don’t sweat it, seriously. The folks who work at marijuana shops are generally well trained and happy to patiently help rookie consumers.